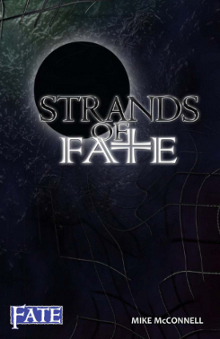 Strands of Fate contains everything you need to tell stories of adventure, action, horror, and intrigue set in any genre. Whether it’s classic fantasy, urban mystery, dashing super heroes, or far future action, this book is your guide. Strands utilizes the FATE roleplaying game system and provides the Game Master with all the tools he needs to get any campaign, of any genre or power level, off the ground and running in minutes. Antagonists and equipment to challenge and aid your characters, whether they’re knights, modern soldiers, or star hopping androids. Click here to find out where you can get Strands of Fate.